100% pure macadamia nut oil for beauty is ideal for use on your skin and hair. This beauty oil absorbs quickly and leaves your skin smooth and moisturized. Macadamia nut oil for beauty is ideal for use on your skin and hair. It is absorbed quickly, Maiden Hawaii Natural’s Macadamia nut oil for beauty leaves your skin smooth and moisturized. 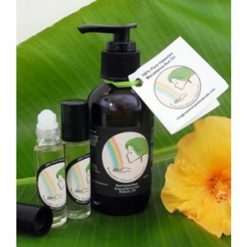 This pure macadamia nut oil product is grown, processed and bottled in Hawaii as a byproduct of the company’s sustainable, community-based of biodiesel project. The grinding mill is located next door to the biodiesel plant which allows for extraction of oil from many different nuts and seeds. In 2015, they began processing discarded macadamia nuts in an effort to reduce waste and promote sustainability. Use by itself or incorporated into your shampoo. The macadamia nut oil will help prevent hair breakage. It does so by penetrating hair follicles and the scalp to strengthen hair and increase elasticity. 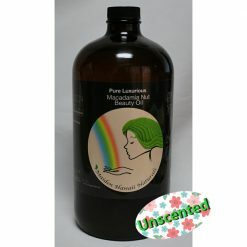 Maiden Hawaii Natural’s Macadamia nut oil for beauty has a pleasant and nutty aroma.